In 1980 a young Bluegrass / Country artist hit the air waves for the first time on his own. Ricky Skaggs had been kicking around the music scene for quite a while, (starting when he was 10), but in 1980 he began his solo career and helped revitalize Country Music. Somewhere about that time Randy Travis appeared on the scene as well and they where both credited with bringing back a form of traditional Country Music. I have always been a fan of traditional Country music and I remember how impressed I was with Ricky's music. I asked my uncle what he thought of Ricky and listed some of the new songs he had put out and my uncle scoffed. “Those aren't new tunes!”, he said, “Their old Lefty Frizzell numbers from the 60's”. Later he would come back to me and admit that the found Ricky Skaggs was quite the artist. I found that I owed something else to Ricky Skaggs as he introduced me to another of my favorite artists, Lefty Frizzell. Ricky combines the bluegrass format with a more modern and, sometimes, more rocky rhythm of modern Country Music. There is no mistaking Ricky Skaggs. When you here him, you know it's him! 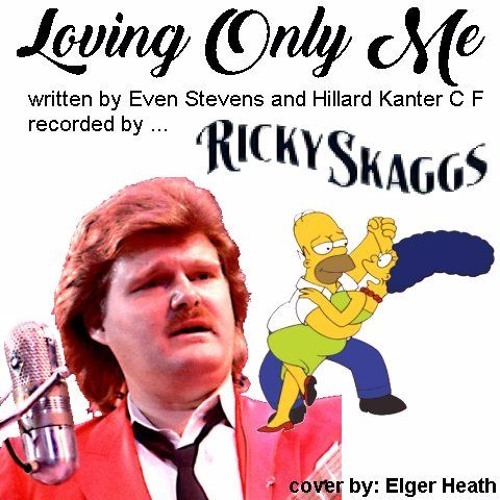 'Loving Only Me' was written by Hillary Kanter and Even Stevens and recorded by Ricky in 1989. It had that pattoned Ricky Skaggs sound and great lyrics and music. It sticks in my memory today and I never need lyrics in front of me to perform this piece. I decided to try recording a simple one-track recording of this song and here is what I got. I've listened to it over and over and I can't really find fault in it so I'll post it just like this. I hope that you'll enjoy this cover. 'Long Live Traditional Country Music, along side its more modern brethren. Change is fine but let's not forget about our roots.